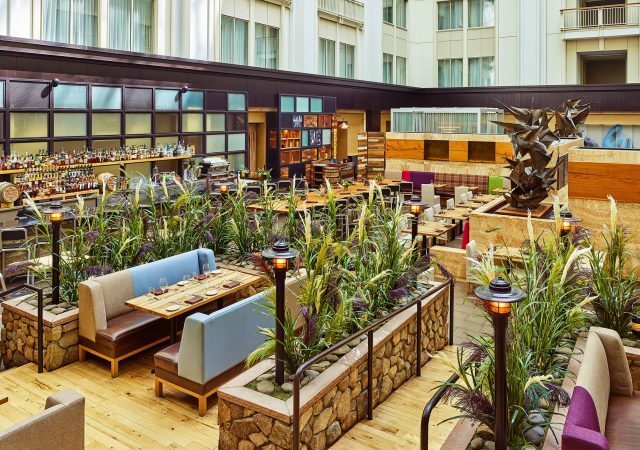 The Urban Farmer, located in our lively atrium, is a modern steakhouse with an emphasis on sustainable ingredients and simple farm to table preparations. Departure, located on the 15th floor, offers a contemporary Asian cuisine in a cosmopolitan setting, and features two stunning rooftop patios with views of the surrounding area. 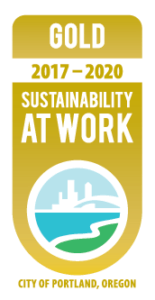 Both on-site restaurants are Gold certified with the Sustainability at Work Program. Departure Restaurant sits atop the Nines Hotel and offers modern Asian cuisine in a sleek, cosmopolitan setting with two outdoor decks and stunning views of the city, mountains and Willamette river. Traditional Asian preparations meet Northwest ingredients in signature dishes such as the restaurant's grilled kushiyaki selections, kobe meatballs and maguro karai honey sushi rolls. Urban Farmer Restaurant redefines the modern steakhouse with an emphasis on Northwest, sustainable ingredients and simple & farm to table preparations. We offer a range of beef options including grass-fed Oregon beef, pasture-raised, grain-finished beef, as well as corn-fed beef. With an expansive wine list and cocktails made with many local spirits, the beverage program extends the concept of local and sustainable. The room features wall-to-wall, reclaimed wooden shelves with 3,000 new and used books from Powell’s Bookstore and Chesterfield tufted leather sofas and purple leather walls. Art curator Paige Powell commissioned local artists to fill the Library with original pieces, including Gus Van Sant, cartoonist John Callahan and painter Chris Johanson. The Library is non-smoking and is available for casual gatherings, cocktail receptions and wine tastings. To reserve the Library, contact Sydney James at 503-802-4638 for details. 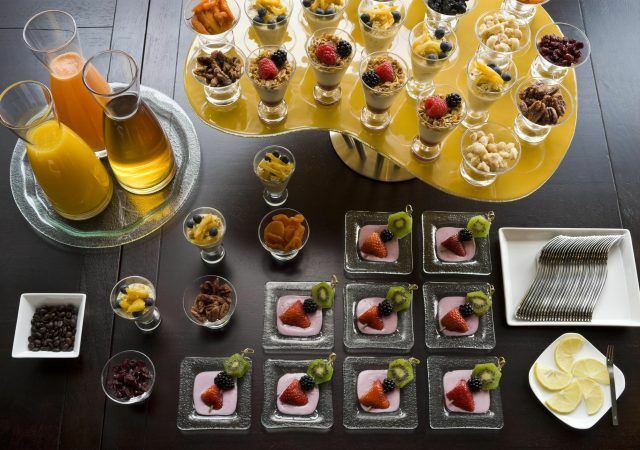 We make in-room dining easy, creating an elevated experience for our guests. Just order room service through your television or call us for further assistance. Please don’t hesitate to let us know how we can make your stay more comfortable. 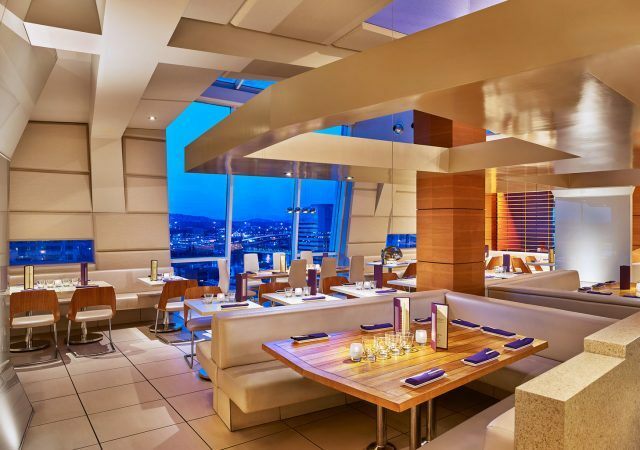 Located in the heart of downtown Portland, Departure Restaurant sits atop the Nines Hotel and offers modern Asian cuisine in a sleek, cosmopolitan setting with two outdoor decks and stunning views of the city, mountains and river. Located in the Nines Hotel in Portland, Urban Farmer Restaurant redefines the modern steakhouse with an emphasis on Northwest, sustainable ingredients and simple, straightforward preparations.